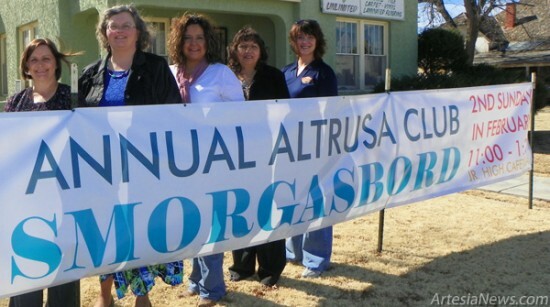 Altrusa Club members, from left, Bobbie Goodloe, president, Anna Pitts, smorgasbord co-chairman, Liz Corral, Ginny Bush and Tawnya Henry, stand with a banner advertising the 50th Annual Altrusa Smorgasbord, set for Sunday, Feb. 10, at Artesia (Park) Junior High School. The smorgasbord will run from 11 a.m. – 1:30 p.m. in the school cafeteria. Tickets are $10 for adults, $5 for children under 12, dine in or carry out. This year’s menu includes turkey and roast beef, rice dressing, cornbread dressing, rolls, mashed potatoes and gravy, green beans, homemade pies and salads. To purchase tickets, contact any Altrusa member or Linda Yates, smorgasbord chairman.